Human resource teams have evolved from being primarily concerned with hiring and firing. With the advent of data, people-first policies, and wider competition for skilled staff; HR professionals have taken on more responsibility. If you’re reading this, you probably manage the most important part of an organization: its people. Hiring the right people is often cited as the most important part of growing a business. Beyond that, you must tactfully navigate complex personalities to keep everyone happy. And then there’s the painful process of separating from people that aren’t a fit anymore. To cope with the variety of challenges that HR professionals are now faced with, many are focusing on employee wellness, health, and happiness. Happy and healthy employees are more likely to come to work on time, engage with their coworkers, and produce above-average results. These results are proven by dozens of studies tying positive ROI to wellness initiatives. That’s right, corporate wellness improves productivity and reduces costs so much that it actually has a positive ROI! Wellness programs are so consistently beneficial that, as more and more data comes in, they become more ubiquitous. As of this writing, over 90% of Fortune 1000 companies offer wellness programs for their staff. But corporate wellness programs take many forms, from one-on-one counseling to team building exercises to smoking cessation products. Here, we’ll share why wellness challenges are an important part of a complete wellness program. 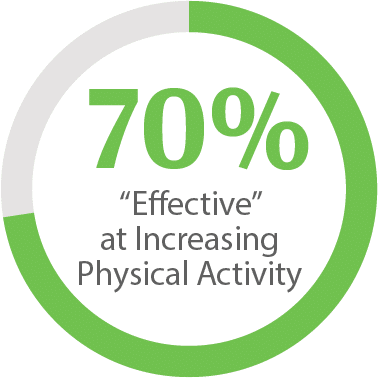 Over 70% of surveyed participants in wellness challenges say that the challenge structure was “very effective” or “effective” at increasing physical activity levels. Pair that with the fact that short-term wellness programs create the same long-term engagement as year-round programs, and you’ve got a simple, measurable way to create a healthier workforce. Wellness challenges offer ways for staff and members to team up around healthy activities like walking, healthy eating, smoking cessation, and alcohol moderation. A collaborative setup, a fun interactive leaderboard, and inclusive activities have proven to drive participation. Generally, a wellness challenge incorporates teamwork, competition, and social support to encourage people toward healthier decisions. Placing people into groups provides an opportunity to pool inputs. providing camaraderie amongst team members and anonymity for people concerned about participation data being publicly identifiable. Among the three elements, competition is proven to be the most effective way to encourage participation. Now, competition doesn’t need to be cutthroat, but it is very important for a challenge to compare the participation levels of the different teams. Also, a public leaderboard is among the most compelling non-monetary incentives for participation. So in all, we’re not interested in any shaming, but a healthy competition among teams with publicly available results is a surefire way to increase your participation. For a challenge to benefit everyone, everyone needs to know what it is and how to participate. It also must actually be inclusive of everyone, so social support is key. Interestingly, social support, by itself, actually produces lower engagement than a control group with no incentives at all. But, when paired with teamwork and competition, social support completes a trifecta and dramatically improves participation. Professionally run wellness challenges should offer communication tools and be inclusive of all ability levels, device types and input methods, and more. The last component of social support is incentives. To ensure your program has optimal participation, be sure to put some sort of incentive in place. It could be anything from financial benefits to priority parking spots or goofy swag. Whatever you pick, make sure that all participants know what the incentive is and what inputs are required to best compete for it. Among corporate wellness, more HR teams trust that improving team’s health and fitness is a clear path to improved workplace happiness and performance. While weight loss and fitness challenges are among the most common, we offer a word of caution on these. First, not all weight loss is healthy. Second, not everyone needs to lose weight, so it takes away from the teamwork and inclusivity elements. Third, not everyone can lose weight due to various health and diet issues. Within “fitness” challenges, we want to again be inclusive of the whole organization. These aren’t meant to get your marathon runners to pool their miles competitively – it’s to increase the overall posture of healthy activity for everyone in the workplace. This includes sedentary roles, disabled people, and more. HR professionals must set the bar on activity that is universally healthy, accessible to all, and fun. We believe that step challenges are absolutely the best challenge type to improve team health and collaboration. Step challenges check all the boxes. A US Chamber of Commerce study says that 80% of people aren’t ready to take action to improve their health. A short-term challenge based on activity that everyone is already doing (moving!) provides a low barrier to entry that can help that 80% take the first step that can lead to major lifestyle improvements. For administrators, many of us aren’t sure where to start with corporate wellness. Before committing to a major overhaul or a perpetual plan, short-term challenges provide a great way to learn how to implement, operate, and measure a wellness challenge. And short-term challenges provide long-term results – According to a thorough, comprehensive study of over 2,500 individuals, the healthcare ROI on “continuous” participation in health programs versus “sporadic” participation was nearly indistinguishable (.006 / .6%). Your short-term program isn’t wasted, it’s actually motivating people as much as year-round programs. We believe step challenges are simply the best and simplest way to get started with holistic corporate wellness. It provides, in a short time period, a long-lasting benefit to all of your staff. The overwhelming majority of step challenge participants say that step challenges are effective in increasing physical activity levels. Step challenges start at a level of activity that we can all do. Professional step challenges, like those run by Walker Tracker, also allow people with disabilities to participate with a variety of activity conversion tools and mobile device access that can track many kinds of locomotion. Also, steps can be automatically logged using any type of wearable device, so people can participate without distraction. For the luddites on your team with no wearables or smartphones, third-party providers allow users to manually convert their activity into steps and submit it to the challenge. With step challenges, everyone can play! Friendly competition was never easier! Using custom maps, step challenges offer fun leaderboards. Walker Tracker has let users step their way along the underground railroad with a map with markers for each participant. Companies can pit two different offices together and have them “race” toward the other office. Larger teams can pool steps to see who can walk around the globe the fastest. The possibilities are endless. Pair that with funny team names, hilarious icons on the map, and silly activities to increase step counts; step challenges help your team bond, communicate, and collaborate. With great third-party apps, teamwork has never been easier. To protect privacy and increase collaboration, it’s easy to put people into teams and then pool their steps together. These same apps also have tools that let administrators educate participants, send words of encouragement, and provide live updates all within the step challenge experience. The most advanced step challenge administrators actually use these platforms to cross-pollinate and educate staff about other wellness programs and benefits. Step Challenges are great for first-time challenge administrators and seasoned pros alike. They work for workforces of any size, location(s), and ability levels. And they’re proven to improve productivity and reduce costs at rates greater than the cost to run the programs, themselves. Running your first wellness challenge? 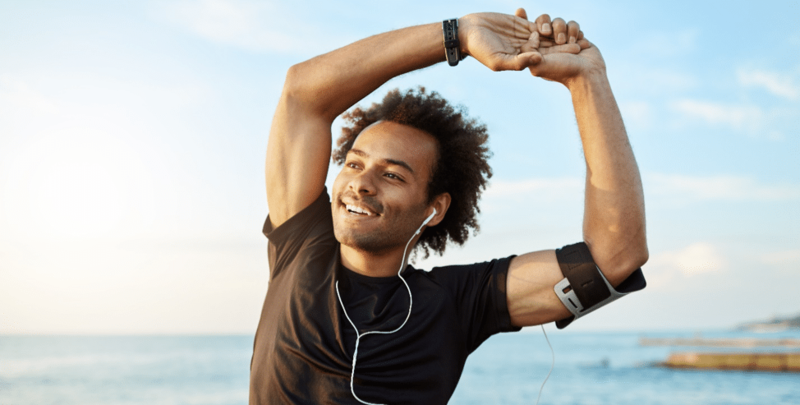 Now we know that wellness pays for itself and that a wellness challenge is a simple way to improve your wellness culture, so what are the steps to get one started at your workplace? ▢ Is it inclusive by ability? ▢ Is it inclusive by device type? Can non-smartphone-users participate? ▢ Are you storing personally identifiable information? If so, do you have appropriate security protocols in place to protect your participant data? ▢ Likewise, be sure to allow participants to set user names and other terms so that their personal info isn’t being shared with other participants. For fitness challenges, be especially sure to protect location data! ▢ Ensure that participation data reflects inputs in competition turns. Any layperson should be able to tell who is in the lead, by how much, and what actions are driving the competition. ▢ Plan a fun way to reward the winners – an end-of-challenge party, a well-formatted company-wide newsletter, or similar are great ways to get started. If you follow these steps, you’re sure to be on your way to a happier workforce. Of course, it’s natural to look at these steps and want a professional by your side. Or to have a proven system in place rather than re-inventing the wheel with spreadsheets. Or to dedicate so many staff hours to implementation that you might’ve been better off buying a challenge package. Challenges are a fun way to include everyone, remain compliant with HR regulations, and genuinely improve the health of the lifeblood of your organization. Running a challenge is a simple way to quantifiably engage your organization and delight your participants and managers. Walker Tracker has a step challenge for every organization size. Our Turnkey solution checks all of the boxes and gets you out the door with a best-in-class challenge. We also have an Enterprise solution that works great for larger teams while giving you granular control over every element of the challenge. Enterprise also acts as a way to learn more about your staff while providing critical data that can actually inform on other elements on HR – it’s a truly complete package.